Ugh. Although I enjoy both the exercise of writing about the LearnedLeague knowledge contest and the concomitant feedback it generates from fellow players and sideline observers, I am less than wildly enthusiastic about — nor therefore was I, up until the last minute literally seconds ago, even committed to — typing about trivia questions for an hour-plus every weeknight for the next month at the height of outdoor tennis season. Nor do I particularly care to make a permanent public spectacle of the epic choke I pulled off today. I did remember from chem class all those years ago that the “sublimation point” was where a solid turns directly to a gas without first becoming a liquid or even passing Go. The question itself told us the phase transition that every S’more chef already knows: that melting is when a solid converts to liquid. That left “gas to solid” as the third leg of the triangle, which sounded OK for deposition. (We attorneys define deposition as “a frequently useless aspect of the discovery process.”) And sure enough, “gas to solid,” or as the official answer more accurately worded it, “Gas, Solid,” was correct. 2. What was the name of the middle and long distance runner, one of the most famous individuals in the history of sport in Finland, who won nine Olympic gold medals during the 1920s, and was known during his time with countrymen Ville Ritola and Hannes Kolehmainen as the 'Flying Finns'? I didn’t know this and knew I was not going to guess it either. So I gave a shout-out to my two favorite Finns, awesomely named orchestra conductor Esa-Pekka Salonen and touring tennis professional Jarkko Nieminen. I went with “Esa-Pekka-Jarko Salonen-Nieminen.” I was wrong for reasons far more fundamental than my careless misspelling of Jarkko (which would have been forgiven anyway (and which embarrasses me further in that I have always found that spelling incredibly cool)). The correct answer was Paavo Nurmi. I’ve heard of him. Gave this one the 3, a good move as it also stumped my opponent. 3. Book VI of Sir Thomas Malory's Le Morte d'Arthur chronicles the quest of the Knights of the Round Table to achieve the Holy Grail. Ultimately, only three achieve the Grail; name any one of the three. I read my share of folklore and mythology as a kid (Hubris! Pre-fall pride! Foreshadowing! ), including Edith Hamilton’s Mythology and T.H. White’s The Once and Future King. I’m reasonably familiar with the Knights of the Round Table and have also visited the ruins of King Arthur’s legendary home, Tintagel Castle in Cornwall, England. I felt pretty confident that of Lancelot and Galahad, the Jordan and Pippen of the Knights of the Round Table, only Galahad reached the Grail. I wasn’t sure but liked Percival as a Horace Grant who got there with Jordan. No clue who was the Steve Kerr. Sure enough, it was Galahad, Percival and Bors. 4. Since 2008, the Miss Teen USA beauty pageant has, oddly, not actually been held in the United States, but rather at a vast mega-resort and waterpark complex in what country? In this case, although I had no clue where the pageant was held and “Donald Trump’s inappropriately libidinous imagination” was not a country, “a vast mega-resort and waterpark complex in what country” could only be referring to the ginormous Atlantis resort in the Bahamas, and therefore the correct answer was the Bahamas. And so it was. 5. Elvira, Bobby Sue, and (I'm Settin') Fancy Free are among the hits from what country music vocal group? Didn’t even know the other two songs, but I know Elvira and that it’s by the Oak Ridge Boys. Incredibly, they were not from Oak Ridge Drive several blocks east of my childhood home in Glencoe, Illinois. 6. 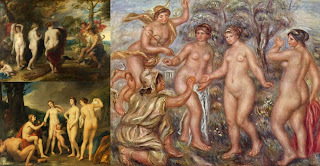 What is the name of the apple-offerer in these paintings? Annnnd this is where I choked the match away. Had I stopped to think about this for more than 0.6 seconds, I would have remembered that it was Paris who offered up the apple at the Judgment of Paris, offending Aphrodite, who in turn kidnapped his hot girlfriend, Helen of Troy, launching the Trojan War, inspiring the Iliad and more importantly a Brad Pitt movie, etc. But I didn’t read the question carefully, thought I had the answer, and quickly answered this sixth and final question so I could play defense and move on to whatever in my life was next. I was stunned but not surprised when I saw the answer was not Aphrodite, which I guessed, but in fact Paris. I thought this question was so easy — as indeed it was, to me on a good day at least, but to my mild surprise, not to the LL in general (21% correct leaguewide) — that I defensed it with the 0. My opponent gave me, that is to say would have given me, 2 points for it, so I ended up losing by 1. A giftwrapped victory for him, and a bitter memory for me that, given my accursed trivia memory, should take approximately 16 years to forget. Went up against RoyS who's new to the Champ Rundle. He has no true weaknesses. 1. Much like you, despite not having heard of deposition, I knew the names for the other transitions so that left gas to solid. 2. Frankly, Nurmi just popped into my head and I went with it. I was just hoping he wasn't a modern hockey player or some such. 4. Same reasoning - I assumed it was a tropical location and the only one fitting the description which came to mind was that big honking Atlantis thingy. 5. Only knew Elvira but that was enough. When it was first out, I worked in a dental lab making crowns/bridges and when it came on the radio, the folks would all sing it loudly. Thankfully I didn't answer "The Buccal Ridge Boys"
6. Can't get 'em all, at least not today. I had never seen the artwork. 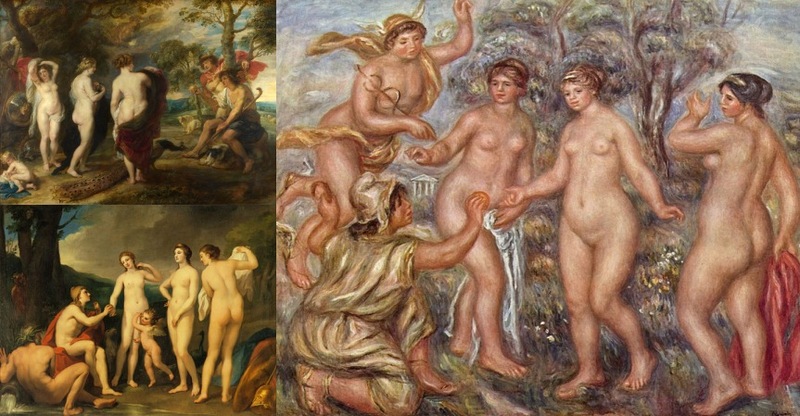 I had an art history class in college and still the actual art pictured triggered nothing. I was pretty sure I could tell what the story was, though. Eris, ticked off at not being invited to the party tossed in the apple. Eris. That's it. Good answer. Except it was wrong. I still pulled off an 8(5)-4(4) win with my opponent missing the last two. Winning when you miss a question in Champ is a rarity, but I managed. Yay! This is where I get to say, "You know you're old when..."
Paavo Nurmi, gas/solid, and Galahad all brought forth instant 'gimme' reactions. No clue whatever about 4 and 5. And I reeeeally had to squint at the paintings, because I knew Eris tossed the golden apple (inscribed "For the Fairest"--a surefire troublemaker) but Paris (not too quick on his feet) named an award-winner that left all but one lady insulted and vengeful. Does this mean I would have lost in an impressive manner? Are the test questions weighted for age (given how long it can take the synapses to fire)? Obviously, success in this league largely depends upon what you know. Age can be an advantage and/or disadvantage, depending upon the day. Of generally greater consequence than age is how well you play defense against your opponent. The elegance of LearnedLeague is that you play both offense (answering Qs to score points) and defense (trying to minimize your opponent's point total) every day. A few weeks ago at lunch, I was telling one of my work teammates about how much I hated thermodynamics when I studied physics. In a follow up, he asked, "So what's the physicist's term for something melting?" I said, "...It's melting," which he did not accept. As a result, I looked up the terms for all six gas/liquid/solid state transitions. Conveniently, I managed to forget deposition between then and now, but as I was able to pair up everything else: boiling/condensation, melting/freezing, sublimation/??? I was able to get it. My first boyfriend listened to the Oak Ridge Boys pretty often, which was weird because it was at odds with what he listened to the rest of the time. Then I dumped all of this sort of side information about him years ago, and could not come up with the name. Very frustrating to know the songs, be put back into an uncomfortable mental place, and not be able to resolve to an answer. Wow. It is only upon reading your comment that I realize there are six state transitions, not three.